Anytime you enter into a relationship in business, there’s a process involved. When we look at the supplier partners we have relationships with, we see the commitment and common goal we share. Our unique partnership aligns us with a united focus: the consumer. The supplier has the product. The consumer wants it. Bernick’s connects the two. When we look for potential suppliers, we look for many qualities with three in particular that top the list. Obviously, the beer has to be very good beer. As Scott highlighted in his blog on Minnesota craft beer, independent craft breweries continue to pop up across the state at a rapid rate. In a supply and demand world, there is both when it comes to craft beer. What makes the beer good? It’s brewed in small, controlled batches. The brewmaster has credibility. It’s highly scrutinized. That means that as craft beer moves through its brewing process, it has to be done by an exacting eye and after fermentation, an exacting palate. Brewers have to know the beer they are producing is to the highest quality. They have to self-govern and be willing to dispose of any beer that doesn’t meet standards. Bernick’s is counting on good beer to deliver to consumers. Another aspect of craft beer that makes it great is there are no cheap imitations. If you think of an IPA – one of America’s favorite craft styles – you can name several from different breweries. Yet they don’t compete with each other, per se. While top shelf liquors and even soda have knockoffs, there is no such thing in craft beer. Good beer is made by good people. Getting to know who is behind the beer is very important to Bernick’s, because we are a company built on relationships. There has to be that mutual camaraderie and amicability for a partnership to be fostered. We seek adventure-minded people who are looking for new and innovative ways to reach consumers. We have a passion for craft beer at Bernick’s, an asset when it comes to our supplier partners. It’s no secret the current state of craft beer is a positive one. A common thread woven into nearly every craft brewery is passion. We spend time internally as a team on our goals and strategies when it comes to our partnerships. When we decide we’re ‘in’ on specific breweries, we’re all in. Distribution is about far more than delivering beer to point A from point B. The people, the culture, and the connection we make with our supplier partners are key to a successful relationship. 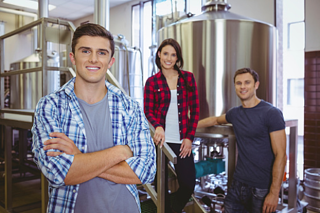 Beer making as a business and career goes beyond just wanting to make good beer, and eventually, more of it. Because the local craft brewery boom – 25 new breweries opened in Minnesota? in 2015 alone – doesn’t necessarily look like it’s going to cap anytime soon, we have to make sure our agreements with suppliers are future-proof. This includes sharing goals and visions, managing growth, and predicting production scale over the next few years. I would imagine that within 10 years, the market will not be as hospitable to growth, instead brewers will be more conscious of being incredibly focused on small, local areas and making them as profitable as possible. Some of the people we meet from the beverage supplier end have a pretty firm grasp on what their future holds, and are meticulously planning for the phases after their grand opening celebrations. Safeguarding against shrinking margins, losing the initial engagement and support of consumers, and outgrowing facility space are all measures a new brewery should take in an effort against failing to prepare for the future. Once these criteria are met, we let our relationship continue to grow with potential suppliers. We start to engage more, and define what a possible relationship looks like. When everything comes together, we hope to have the start of a very successful relationship.